The TUFF Kitty Puff ®comes in assorted brilliant colors in very tightly woven yarn. Colors range from Blue, White, Gold, Green, Red, Dark Pink. This standard size cat toy is 1 1/2 inches in diameter. Cat Owners today are in search of classic toys that their cats love the best. Usually it is the toy their cat played with as a kitten, or it is that old favorite toy that brings out their natural hunting instincts. Some of these favorites of yesteryear have been phased out and replaced with faux fur, dyed fur or products that fall short of durability. It is amazing how the cats know the difference! 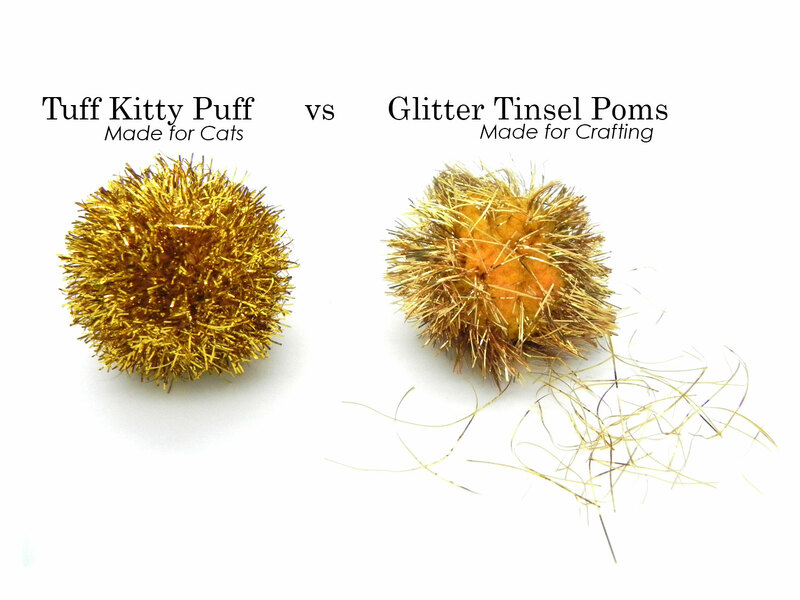 After years of field testing toys of all kinds,we discovered that our best sellers were the Sparkle Ball, the Natural Rabbit Fur Mouse, and the Natural Rabbit Fur Pom Pom. We realized these old time cat toys were not only durable, but also great for bringing out cats natural hunting instincts, and proven to increase activity and exercise. 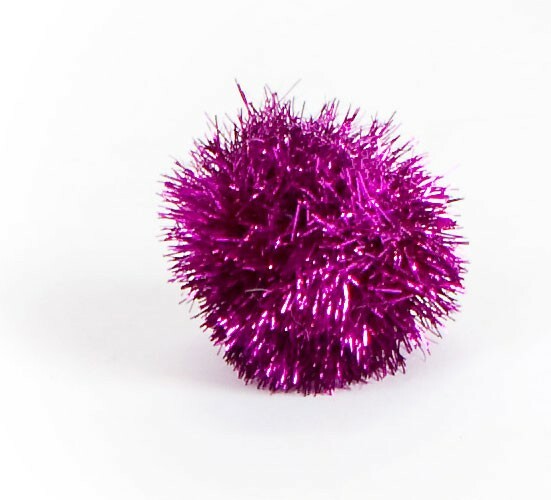 The Tuff Kitty Puff® and the Jumbo Tuff Kitty Puff® Sparkle Ball come in assorted brilliant colors in a tightly woven ball for durability. They don’t fall apart like other sparkle balls! We discovered the sparkle balls are the only toys our girl loves, and I mean she LOVES them! She even lost a little needed weight after we found these toys since she plays so hard with them. However we had other brands first and discovered she was tearing them apart and trying to eat them. Luckily nothing happened, but we had to find a solution and these are it! They stay together much better than any other type we tried. She’s been playing hard with them for a few weeks and they are still fully intact. I am fishing them out from under the couch and other furniture every day for her! Will definitely buy her these from now on! These balls hold together very well, unlike the sparkle balls you can buy in craft stores. We can't recommend these toys highly enough. We've even given them away as gifts to other cat owning friends, and they are amazed at their cats reaction. My Calico just loves these sparkle balls. She will spend hours playing with them. She bats them around and runs down the hall with them. At the end of the day we go looking for them. My two cats absolutely LOVE these sparkle puffs. They3013 totally ignore their other toys and they know exactly where I keep them and sit in front of the drawer and wait to be given one. They toss them in the air, bat them all over. About every two weeks, we have a round-up and retrieve them from under then dressers and china cabinets, etc. One word of caution: At one time I had order ones that were tinier in size and they swallowed them (and vomited them up, thank goodness) these are perfect size. There are larger ones, but they don't like them at all. Cleo, my 5 month old kitten was playing with similar tinsel balls from Hartz but the tinsel was coming off (which concerned me) and she kept losing them. While searching for replacements, I came across these and they're everything the description says they are! She loves them and won't play with anything else!